Before coming to us, Sun Rae was used to living in a stall in a barn, and working in an arena or a round pen. She competed, and did barrels and poles. Then she came to us and was suddenly expected to mingle with other horses and walk down trails in the woods. It scared her. She didn’t make friends easily, like the other horses did. Willow, our Belgian mare, terrified her initially, and she would want to keep her eye on Willow at all times. She would become agitated if Willow was out on a trail ride. When she couldn’t see Willow, Sun Rae would weave back and forth in her stall and call out until Willow came back. 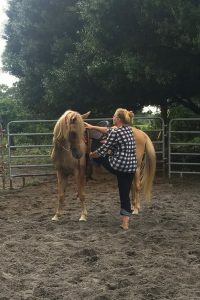 We normally try to pair a new horse with a buddy, so they adjust more quickly to their new home, but Sun Rae wouldn’t buddy up to anyone. She hated the trail. We were at a loss what to do with her, so we put her up for sale, thinking that maybe if we rehomed her, someone would give her her old job back, and she’d be happy. But slowly, over the course of more than a year, things are beginning to change. 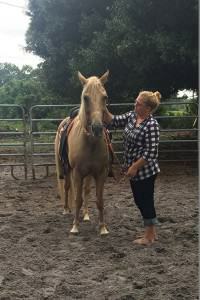 She’s warming up to one or two of our other horses…..Starbuck seems to be accepting her as a friend. Willow no longer terrifies her. She does not break into a nervous sweat on the trails any more. 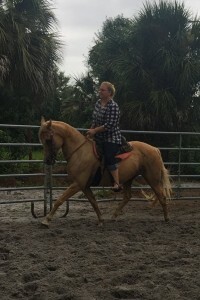 She’s much calmer under saddle, now that she understands that she does not have to run full blast when someone gets on her….. 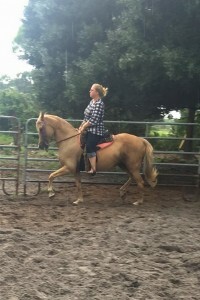 These are some pictures taken today of Brittany working with her. 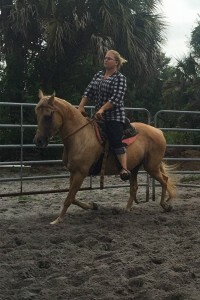 It’s a gloomy, rainy day, but her pretty palomino coloring pops against the clouds…. 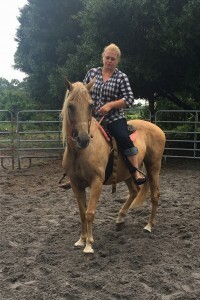 This entry was posted in Uncategorized and tagged Bradenton Horseback Riding, Florida horseback riding, Florida Trail Riding, Hillsborough County Trail Riding, Mare, Palomino horse, Tennesse Walking Horse, Tennessee Walker, Trail horse.